Welcome to Hoppynge Farm and this website is all about our Boer goats and meat goat farming enterprise. It is also about other breeds of goats, from meat goats to dairy goats and all about goat farming. We also have an interest in dairy goats, goat cheese and goats milk and a lot more. 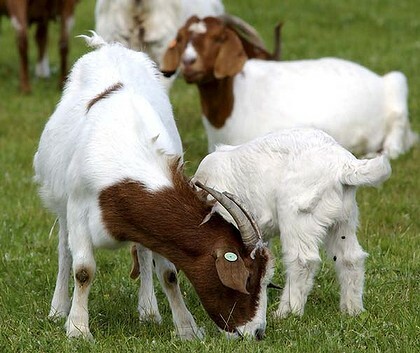 This site is your one stop Boer goat resource and a lot more about goat farming in general. You can advertise your goats for sale or look for goats or simply advertise your own goat breeding farm, so add in all the details and help your business and also add in a goat image, you get your own web page for free! If you have goat supplies and are in to raising goats share your passion and share your information. The humble goat gets a lot of unfair press, yet people use goat related words every single day of their lives, this ranges from your own family of kids, you’ve got to be kidding, just kidding (anyone knows how real goat kids are when kids), or handling someone with kid gloves (gloves made of soft kid skin). and so the list of goat references goes on. Goats are in fact very intelligent, and unlike common belief they don’t or wont eat everything (rather picky really). Coffee is a goat thing! In fact you might not realize this, but coffee was found by a goat! Yes! a goat ate the unknown berries and when an Ethiopian goat herder noticed the goat’s caffeine enriched hyperactive behaviour and investigated, and so coffee came into our lives. That's why its called Starbucks! This website site will develop and carry a large range of goat related articles and goat information for those that raise and breed them to those who have goats as pets. This site of by goat breeders for all goat lovers and for all goat breeds.